This post will provide you with all the information you need to obtain your retirement visa, and answer all the nagging questions to which you have seen conflicting answers for all over the Internet. What is a Retirement Visa? In truth, there is no such thing as a retirement visa, per se. However, when we talk about a retirement visa, we refer to it as such because people applying are generally retirees intending to spend their retirement in Thailand. Moreover, you can't work on this type of visa, so it's generally for those who've stopped work and entered the sunny side of life. What most refer to as a retirement visa is officially known as an extension of stay based on retirement. The way the extension of stay based on retirement is obtained is by entering Thailand on a Non Immigrant O Visa, which we will discuss a little later, and then by obtaining the retirement extension from an immigration office – provided you meet the requirements. Retire in Thailand, enjoy the good life. What Are the Retirement Visa Requirements? Or, ฿800,000 in a Thai bank account for 60 days+ before applying for the extension. And ฿800,000 remaining for 3 months after the extension, and ฿400,000 thereafter. The ฿800,000 must be in the bank for at least 2 months before your visa application. As of 1st March, 2019, the ฿800,000 must also remain in your bank for 3 months after the extension, and, after those 3 months, you must keep ฿400,000 in there indefinitely. You also need a letter from your Thai bank to confirm the ฿800,000 is there and has been there for the required time frame. For consecutive visas (so the second and third year) the ฿800,000 has to be in the bank 3 months before you apply for the visa, and the other rules remain the same. Note that you need a letter from your bank verifying the balance and a copy of your bank book. Note that you can also use foreign currency, but the money must be the equivalent of ฿800,000 Baht. There are a number of banks offering foreign currency accounts, but you must make sure that the amount you have in there equals the requirement for the extension of stay: exchange rates fluctuate throughout the year, and this may leave you short if you don't monitor it. => Read more about opening a Thai bank account here. Instead of having ฿800,000 in a bank account, you can show an income of ฿65,000 per month, without having to bring the money into Thailand. For those who don't want to tie up such a large amount of money in what essentially will be a zero interest account, it may be preferable to use this requirement, particularly if you have a steady pension income, or income from investments. You will need to provide details of this income over a three-month period, by way of bank statements and through a notarized letter from your embassy that verifies the monthly income. British and US nationals are no longer able to obtain a letter from their respective embassies to confirm that they have a pension income or other income of the required ฿65,000 amount. This means that nationals of these countries will have to go down the route of having ฿800,000 in a Thai bank account, or they must have the ฿65,000 income paid into a Thai bank account each month and prove this by way of a 12-month bank statement history. This is problematic for those who have not held a bank account for 12 months. It is therefore likely that British and US nationals will have to go down the 800k lump sum route, at least for the first year anyway. On the plus side, money transfers to a Thai bank account are relatively cheap these days (see the link below). * It is expected that other embassies will follow suit and stop issuing income letters too. I will update this article as and when this happens. What If I Don't Meet the Financial Requirements? Perhaps you don't have an ฿800,000 lump sum of money to put in a Thai bank account, or a monthly income of ฿65,000. In this case you can still meet the financial requirements by combining the two. (British and US nationals are currently unable to obtain this income letter). Passport with Non Immigrant O Visa inside. Photocopies of: photo page of passport, page showing visa, page showing last entry date into Thailand. TM.7 (extension of stay form completed and signed). Attach a passport photo and include phone number by your signature. Proof of funds and or proof of income (letter from bank/embassy). Bank letter cannot be more than 3 days old. If using the lump sum application route, you'll need an updated photocopy of your bank book page that shows the balance. Obviously take your bank book along too. Once you have your retirement visa, there are two important rules that you must follow to ensure that you do not overstay your visa or invalidate your visa. You must conduct 90 day reporting. This means you must report to an immigration office in Thailand every 90 days. This is because Thailand has a law that states that a foreign national must produce his/her address if staying in the kingdom for 89 or more days. The address is reported on a TM48 form. 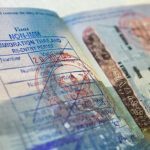 Perhaps the most common mistake foreign nationals make when living in Thailand on a retirement visa is leaving the country without getting a re-entry permit. A re-entry permit can be obtained from an immigration office or the airport before leaving the country. This permit will be stamped in your passport and protects your visa from expiring while you are outside of the country. If you do not get a re-entry permit, then your visa will be invalidated and when you re-enter Thailand you will get a standard 30 day exemption stamp. As noted, you can obtain a re-entry permit as you are leaving the country. However, if you are able to plan in advance, it may be better to get one a few days before you leave to ensure that you get it done in time and don't miss your flight if you are in a rush to the airport. The re-entry permit form is known as TM13. I have written extensively about the re-entry permit in this post here. Your retirement visa (extension of stay based on retirement) will last for one year. But don't wait until that year is almost up before you start planning to renew it. In fact, you can renew your visa up to 45 days before it expires. Remember that you need to ensure that your Thai bank account balance does not fall below the ฿800,000 threshold three months prior to renewing your visa. Also consider that if you need a proof of income letter from your embassy, you should plan this at least a few weeks before you apply for your visa. Some embassies require you to make an appointment and they may be busy at the time you apply. Don't worry though, the letter from your embassy will be valid for six months, so is perfectly fine to obtain the letter up to a couple of months before you need to renew your visa. Each partner obtains a retirement visa by following the financial requirements laid out above: that is ฿800,000 in a Thai bank account two months prior to applying; or proof of ฿65,000 income per month, as verified by your embassy; or a combination of the two. One of you obtains a retirement visa and the other receives a visa as his/her dependent. The visa holder is generally the male party. The easiest route is for you to both independently get visas. One reason for this is that if the main visa holder were to pass away then the dependent's visa would be immediately void. This could be problematic because it would present you with a visa issue to overcome at a time when you would be going through a lot of grief and having to sort out a lot of other things in your life. In this situation, you could essentially leave the country and come back in on a 30-day exemption stamp, or get a tourist visa from a Thai embassy in a neighbouring country. But this still might not give you the time you need to get all your affairs in order and take care of probate. It sounds quite morbid, but it is worth considering – because at a time like this you would not want the hassle of sorting out visa issues. The other reason to avoid going down the dependent visa route is that Thai immigration has moved the goalposts on this visa are a couple of times over the last decade. Both times they have reverted back to the original rules, but it can cause confusion and be problematic. In the case of a dependent, immigration requires the financial aspect of the extension to be provided by the male party and not through a joint bank account. Similarly, if you are using a letter from your embassy to prove your income to extend your visa, this must solely be in the man's name and not in joint names. In other words, the income is verified as the man's income and not a joint income. It is also worth noting that if you are seeking to obtain a dependent visa for your spouse and your spouse is not yet 50 years old, your spouse must enter Thailand on a Non-Immigrant O Visa. 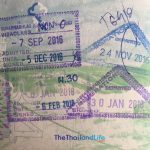 This is because a 30-day on arrival stamp cannot be converted into a Non-Immigrant O Visa inside Thailand, if you are not yet 50 and seeking an extension based on retirement. The most common pathway to getting the extension based on retirement is to obtain a Non Immigrant O Visa (90 day validity) from your home country before you arrive Thailand. You can obtain this visa in Thailand, but then that's an extra step that you will have to go through with immigration before applying for your extension of stay based on retirement. It really isn't difficult to get from your home country either, so it is advisable that you do this. Here are the requirements for the UK Thai Embassy. Please note that requirements may differ slightly from country to country. Once you have your Non Immigrant O Visa, you can enter Thailand and stay for 90 days. You will have to wait 60 days before you can file your retirement visa application at the immigration office and follow the steps laid out in this post. Have I missed anything? Still got a question? Leave it in the comments below. "Sunny side of life"???!!! Clearly you jest )or are planning a new career in the marketing of cosmetics on the BTS). The question I have is which O-visa does one apply for? The O-A has all the requirements you list for getting the extension (plus the medical and criminal checks) along with the full-year validity, and (at least at the Royal Thai Embassy in the US) the Family or Volunteering O's are the only other options (other than the O-X). Is there a special O that gets you in and then allows the retirement extension? Thanks! You apply for a Non Immigrant O visa under the category of "retirement (with State Pension)". If you are not in receipt of your pension, you can enter Thailand and get the Non O here. Or you could go for the O-A, but that's a bit more of a hassle. So, once I shook off my confusion I did some research and now my confusion has been replaced with the befuddlement that comes from "Ah, yes. Thailand. Of course they do it that way. "Your instructions work perfectly when one is applying from the UK. However, in the dour land of my primary residence - the US - things are different.Here is the form for the US: http://thaiembdc.org/wp-content/uploads/2015/12/Visa-Form-2015.pdf Within it there is no mention of a state pension or any of the other fun things in the post. Neither in the instructions.The UK gets a completely different form: http://www.thaiembassy.org/london/contents/filemanager/document/visaapplication18.pdf With full instructions to proceed as you advise.God only knows what is else is different in the other (2n+1) countries served by a Thai Embassy. So my question is: do you need a pension or any other financial requirement to get the initial Non Immigrant O visa in the US? If not, then that's easier than the UK. Yes. Same requirements. The criminal check is easy we can just order them up online for like US$5 (Since there are so many criminals here they can do it at a discount...) and the medical check, while significantly more expensive, is quite humorous for the doctors here. I see. The criminal check is a little more difficult here and takes around 4 weeks to come back. That's the thing, there is no Non-Imm O for retirement (with State Pension) option in the US. The only options are O (for Family or Volunteering), O-A, and O-X. The O-A/X can be applied for directly as in the UK but we apparently do not have the intermediate option. It seems weird that they would have different types but I can't find any reference to the State Pension option anywhere on the Embassy site in the US. Does the O-A require the background checks like it does in the UK? I guess it would just be best to enter get the Non O in Thailand. It's a strange system. I can't understand why they have never had a specific retirement visa. I guess the O-A is kind of that. Hi David,This is the advantage of the O-A.The Non Imm O-A Visa allows multiple entries of 1-year until the 'enter before' date.If you go out and back into Thailand before your 'enter before' date, you will be given permission to stay for another year.If you plan to leave Thailand during the second year of your permission to stay you need to purchase a re-entry permit to keep the validity of your permission to stay valid.You can apply for a 1-year extension of stay based on retirement within the last 30 days of your permission to stay,At this point, you will need to show funds or income, as detailed in the post above, to get the extension. Many thanks, that gives me the two years to save the 800,000฿ And just leave it my Thai bank account to meet my next visa application. I am a US citizen and in 2017 received an OA visa from the Thai consulate in Los Angeles. In 2018 I renewed my visa using a combination of a Thai bank deposit and an income verification affidavit from the US embassy. It is time to renew my visa and the US embassy has ceased issuing income verification affidavits. I receive over 800,000 baht per year from Social Security and investments. But I do not have the money to deposit 800,000 baht in a Thai bank account as my money is all invested. What do I do? Leave the country appears to be the only answer. Any suggestions? Hi Chris,Places to start: the international SSA office for Thailand which is located in Manila. Contact info: https://www.ssa.gov/foreign/foreign.htm#Tahiti (The #Tahiti just takes you to the first entry under T.) They may be able to provide a more official looking letter than you can get off your My SSA online account.You can get a certified copy of your most recent IRS 1040 by requesting same with an IRS Form 4506.Your bank/investment house should be able to provide you with a letter that states income you received from the SSA and investments as well.Good luck and I hope you report back how it goes. FBU in Manila does not respond to any current requests for assistance. They may be backlogged due to the recent shutdown. The registered mail I sent to them is being held at Customs in Manila for over two weeks now. My bank does not provide a letter. I've compiled the following to take to Immigration this month.. Passport photos, Passport, Thai Bank statement, Medical certificate, US Checking statements, US Credit Card statements, SSA Earnings statement, UNICEF Thailand statement, Net Worth Statement, 90 day extension form, 90 day reporting form. Iwill keep yo updated. If you marry a Thai national do you still need the 800,000 or 65k ? The answer is "maybe".. it depends upon your current visa. A caveat is the Thai government immigration main website is displayed in the Thai language and the English language. The information cited in the Thai language is not always fully translated word for word into English. To top it off, each immigration district website does not display the same information. You may find that obtaining a visa at a location other than at Lak Si, District 1 far easier. Hi...Embassy's can no longer provide proof of income letters as of January 2019 the rules have changed :) Money also has to be paid into a Thai bank account. Hi Carol, I recently heard about this. I'm waiting for some official embassy confirmation and official changes to the visa requirements that states the money has to be paid into a Thai bank account. Great. I have emailed you. Thanks. Look into Expat Prescription Drug Insurance through a private insurer. I'm not sure what the rates would be specifically but if you're needing a non-generic medication it might save you a few.Also, do a search on whether your meds are available OTC in Thailand. I know some of the things I get when I'm in Thailand (I keep an emergency supply of antibiotics on hand at home) are available without a prescription in Thailand. The last thing to consider, while technically not allowed, is that pharmacists in Thailand seem to have more, ahem, latitude in deciding where the counter is. If you can bring an empty, recent prescription bottle which was accidentally "dropped in the toilet" it might be easily refilled.The last suggestion would be to visit a pharmacy out in the 'hood instead of in a mall. You'll find better prices and the same availability. There is no such scheme for expats here. Many people bring in more than the 30-day's worth because the 30-day rule is not strictly enforced as long as quantities look small enough to be consistent with personal use and it is not a controlled substance. 2-3 months use might be okay but any medication that looks like a very large quantity would raise issues if checked. You can get all your medication here, though while generics are cheap the proper brands can be more expensive than your home country. You need to update your article as the US Embassy, and other local Embassies, have all discontinued the notarized income/residency letter. The other question might be, Can the 800,000 baht be drawn down for living expenses or does one have to have additional income for that purpose? Hi Fred, I updated my article recently to reflect this change by the uUK embassy, but the US embassy were yet to confirm this change and were still giving out income letters as of the end of January.You must have ฿800,000 in a Thai bank account for 60 days+ before applying for the retirement extension. You then need ฿800,000 to remain in the account for 3 months after the extension, and ฿400,000 thereafter. So ฿400,000 can be drawn out of the account after 3 months. I'm afraid I can't agree with you. I attempted to do an income affidavit at tye US Embassy and was told emphatically that the affidavit was no longer being issued. I also spent a day this week at District 1 Immigration getting a clarification on the new police policy. Your statement is correct to an extent but with a caveat. Every year, at time of renewal, you must bring your account balance back up to 800,000 baht 60 days prior to renewing your visa. Be sure and watch the timing as you have to have tye whole 800,000 baht in your account by that date. Hi Chris, I wasn't disagreeing with you, I just hadn't had confirmation yet on the US embassy; only the British embassy. I will update the post to reflect this change.Indeed, you will need the 800k there 90 days (3 months) days prior to renewal. Your recent update mentions transferring 65,000 baht per month as the requirement to meet the O-A visa requirement. At Immigration I was told that is just the amount you need to show to have available for expenses each month. You can transfer any amounts to meet the requirement as long as you have 800,000 baht 2 months prior to renewal. For example if your visa expires in June, you could transfer 300,000 three times by March and meet the requirement. I use Transferwise to transfer money and the larger the transfer, the better the discount on the handling fee. I usually transfer $9,500 three times a year to save on the fees. My Thai bank is Bangkok Bank and their office in the District 1 Immigration readily prepares the deposit letter needed for a visa renewal. Also their online banking allows salary transfers back to your home country. If there is a Thai bank that allows online transfers to your home country I'd appreciate knowing it! I hate sitting at the queue here. Hi Chris, there are two routes available for the visa, one is the income route and the other is the 800k route. You don't need to do both. In your case you would need ฿800,000 in a Thai bank account for 60 days+ before applying for the extension based on retirement. According to the new rule, you will also need ฿800,000 for 3 months after doing the extension, and ฿400,000 thereafter. For consecutive visas (so the second and third year) the ฿800,000 has to be in the bank 3 months before you apply for the visa.To use the income route, without a letter from your embassy confirming your income, the suggestion from the UK and US embassies is that you will need to show a bank statement (of 12 months) from your Thai bank account with the 65k being paid in each month. I am closely monitoring the new rules to see if there is any backtracking of new interpretations of what has been stated. I will update my post accordingly. Oh my. What was the hold up? I changed my address due to medical reasons which required a handwritten explanation as to why I was not renewing my visa in the same District office. I had to handwrite an explanation agreeing to deposit 65,000 baht each month. I had to sign and acknowledge an over stay form. I had to get the house owner to sign and handwrite an additional document along with their identity card as the immigration officer wanted this in addition to the 90 day reporting as well as the TM 30 to validate my address. They wanted to see one year of monthly deposits but as a US citizen I was relying on the income affidavit that the embassy no longer does. And Bangkok Bank takes three days, not including mail to produce a copy of a twelve month bank statement which exceeds Immigration's three day time limit for a statement. That was an issue. The officers did not have a checklist of what they wanted so every day that I showed up the officers decided to ask for a new piece of documentation. They were nice enough but the whole process was extremely unnerving and left me questioning if it was worth it. Question on your comments on obtaining a “Rentry Permit” on. Retirement Visa. I am living in Thailand on a Retirement OA Visa. With Multiple Entries. I will be leaving Thailand for 3 weeks in March. I was led to believe that I did not need to obtain the Reentry Permit as I have a “Multiple Entry Retirement OA Visa. Was this incorrect information? I will still need a Reentry Permit? Appreciate your feedback. I have the same multi-entry O-A visa and have been in and out of the country 5 times in the last year and never had any problems or asked for a reentry permit. That's because multiple entry visas don't require a re-entry permit, as they are reactivated for a further period of time when you stamp back in. It shouldn't matter if they had a multiple entry Non-O before the extension. If you have an extension of stay but would like to travel outside Thailand for a short period then you will need to apply for a re-entry permit. You can get a multiple re-entry for 3,800 Baht so that you can travel in and out more than once. Hi, thanks for your informative and well-written blog. One question about the retirement visa process. 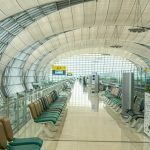 After entering Thailand on the non-immigrant O visa, must I remain in Thailand for the full 60 days before filing a retirement visa application or can I get a re-entry permit and leave the country for, say, a week or two during that period? The reason I ask is that being stuck in Thailand for the full 60-plus days until I get the one-year retirement visa is going to be quite difficult for me given various personal commitments I need to fulfil. Thanks. I don't know the answer to that. I only know that you do still need the bank letter for the initial extension and to prove the 800k has been in the bank for 60 days. I would have thought an up to date bank book would suffice to show that the requirement of 800k for a further 3 months and 400k thereafter would suffice. As always, these rule changes are rolled out without considering the full picture. As such, patchwork will no doubt emerge to fix oversights. It would indeed be interesting to know how immigration wants to control the new rules regarding the 800,000 baht rule. if the control is only checked when applying for extension, the rule does not make much sense, because there are sure to be visa agencies that fake a bankbook for a high price. As I understand it, this new rule should also serve to eliminate these visa agencies. According to this, the updated banking book together with the passport would have to be checked at the 90-day report. Then they would have the hundred percent control. Well, we will see... But there will be kinda exodus of farangs. If I consider a couple of experiences with some "not enough money" expats it might be not bad at all. It might even increase the reputation of the rest. Hey Vlad, I assume that previously agencies have arranged for the money to be in the bank 60 days beforehand and then taken the money out as soon as the extension has been done. But now the money has to be there for 3 months after, and then 400k has to be there at all times. This is hugely problematic for the agencies doing the fraud. I am married to a Thai citizen. I understand that I need to have only 400,000 bahts in my name in a Thai bank to meet the monetary requirements for a retirement visa. Is this true? Correct. Technically it is an extension of stay based on retirement. You need this money in a Thai bank account 60 days prior to applying. Please see the post for the other requirements. Peter, I stopped in at Udon Immigrations to ask about the 65k each month. You must transfer it every month without fail. Cannot skip a month and double up the next. Must be a bank-to-bank transfer, cannot make the 65k deposit yourself. Cannot transfer in excess of 12 x 65k annually hoping to skip a month or two. Big Boss confirmed this. Of course, he said, you could always make it easier by going the 800k route. Seems they are really pushing this, I suspect, to help the banks and the country.Evidently they want an end to guys keeping all money back home and getting by here with an ATM card.Oh yes, the verifying bank letter must be signed by bank manager on the same day as visa extension.They have heard nothing about requiring hospital insurance for retirement visa extensions...Hope this helps?.. Yes, it does seem like they are pushing for the "quality retiree" so to speak. And I guess they are working on the assumption that like attracts like. But how long before 800k becomes 1MB and the goal posts are shifted further? I think that will depend a lot on what happens in the Big Country to the North. When ex-pat retirement becomes a thing for the Chinese worker Thailand may be an enticing destination. But if Thailand can keep the buy-in cost low enough to still be attractive to your "quality retiree" but high enough to keep out 200,000,000 of my "riff-raff" then they might find that bargain attractive enough to exclude some of the western retirement dollars/pounds/euros that will be priced out of the market. What seems to be overlooked is the fact is that it is costly to transfer money every month, more so than transferring the money 3 or 4 times in a lump sum. As a US citizen, if I transfer more than $10,000 at once, alarm bells start in Washington and I want nothing to do with the Feds. Another issue that seems to be forgotten is that if you transfer 65,000 every month and then spend 30,000 every month, at the end when you apply for your extension, you have a 360,000 baht deficit. Add that to the 800,000 balance and you had better be prepared to transfer over a million baht every year! Thanks for the update Dave. The fact that the bank letter has to signed the same day is ridiculous, because you'd have to make an appointment with the bank manager (which they may let you down on) or hope the manager is available that morning. As you note, they are really pushing this and squeezing everyone onto the 800k requirement. I wonder how many retirees there are in Thailand; I can never find a figure for that. 800k x all the retirees is a nice cash boost for the banks and reflects well on the economy. Hi Peter, please read the new rules regarding pension/income letters that relate to UK and US citizens. The embassy is no longer issuing letters and that was the only source immigration accepted a letter from, so you may have to go the 800k in a Thai bank route. As far as I know the new rule only relates to retirement extensions, not extensions based on marriage. I have a question regarding joint accounts. My wife and I are 74 years old American citizens, and have been living in Thailand for the past 5 years with the non-immigrant O visa. We have renewed in past years using an income letter from our embassy. We currently have a joint bank account wth Siam Commercial Bank. If we have 1,600,000 THB in this account will this fulfill the requirements of the Thai Immigration for our separate visa renewals? Or do we each have to have a separate account - one account in my name and one in her name? Are you wanting to do a retirement extension? Immigration considers the funds in a joint account as 50/50%, so you could apply for your separate visas both using this account as long as there is 1.6m in there. That being said, I can't be 100% certain that all immigration offices will follow this rule. It might be best to check first with the office you plan on using. I’m looking for clarification for the “retirement “ visa for a married couple. I understand if one person is 50 they qualify and a spouse younger than 50 can apply for a dependent visa. Can this continue once they reach 50 and then only one would require to prove the financial requirement? What if it is the woman who is the older of the 2? No. The spouse must be younger than 50. otherwise the spouse is required to obtain a retirement visa. First I would like to thank you for putting up great information on this site. I have a few questions.1- Will the Thai immigration accept a rental income from property in the US, if so, how can I prove it?2-Does the Thai immigration accept Supplemental Security Income from the US?3-If my spouse or I decide to apply for the retirement visa as a dependent of the other, then does the 800K route cover both spouses? Thanks. Lots of talk here about requiring O-A annual extenders to have mandatory health coverage from a Thai insurance company (Nation newspaper Dec 2018 describing a Key conference which recommended approval for legislature to proceed). Why just O-A holders? Non-O will surely follow. Have you heard anything on this? This is currently a requirement for the O-X visa. Other than trying to get a few more satang into the economy I think the concern is that the elderly (I count myself among them) won't have the means to pay for health care as the national plans, Medicare, NHS, etc., tend not to cover overseas costs. They don't want somebody to rack up big medical bills and then just depart the country leaving Bumrungrad holding the bag. The Thai medical system is good and relatively inexpensive. I have the same problem that many expats have, too old to buy insurance. The government can require you have insurance to have a visa..they now have to figure out how you can get it, waive the requirement, deny the visa or let it become a non-issue.. It's a simple as that and that is the way many countries handle the issue. I will wait and see..
What type of visa would allow me to bring my personal effect from U/K to Thailand? You can bring what you want; obviously within the restrictions of the airline and the law. You can always ship stuff over too. Be prepared to pay the high customs duties, have a detailed manifest of all of your items, and don't ship any valuables that you can not afford to lose.. I am 5'11 and have no trouble finding clothes to fit so you may want to reconsider what you ship. Indeed. It's best to buy stuff here and bring essentials over in luggage. Living here kind of forces you to live more minimally, at least it does when you're moving around year to year – which is a good thing in my opinion. Hi, I recently decided to bring over my stuff from the UK. I have been on a retirement visa for some years. I sent 5 cartons by sea from UK when I sold my house. The customs duty was NIL. I think I was allowed to do this one time. There are a few restrictions: numbers of one type of item, no toys! Nothing seen as new! I did not even have my boxes opened and checked! It did enable me to bring those possessions I treasured and make Thailand feel more like home! And with the instability of the new visa laws, you may find that at the end of a year you will be happy to leave! I have a follow up on Chris’ comment re medical insurance : if one is too old to buy a medical insurance, what options does one have if any? Can one show proof of funds to cover medical bills? Or is there another possibility? Can a retirement extension be denied on the basis of “no medical insurance”? There is no official requirement for medical insurance for the retirement extension, yet. The plan is to make it a requirement for those with the one-year Non-immigrant Visa "O-A" (Long Stay). They will be required to have a Thai insurance policy covering their entire stay in Thailand with a minimum 40,000 Baht out-patient coverage and minimum 400,000 Baht in-patient coverage. As far I as I understand the new rules, you would need to go down the 800k route this time. Start having your pension paid into your Thai bank account now so that by the time the next extension comes along you have 12 months banking history to show that you meet the 65k per month financial requirement. I’m currently on a non immigrant O-A visa from Australia. I will be residing in Thailand until the visa expires. Can I then go back to Australia and go through the process again and apply for another non immigrant O-A visa. Please note that I’m on the second year of this visa as I left the country and came back before the expiry date so got stamped in for another 12 months. Just checked the Royal Thai Embassy in DC and one is still allowed to use US based funds for the deposit/income requirement for the O-A. The O-X requires the funds to be in Thai financial institutions. If it's not a big deal to get the criminal background check and the medical history (which I've often thought was best done in Thailand anyway...) then get the new visa at home. I have the 800K baht in my account and it has been there for more than 3 months. However, I plan to dip into it immediately after my retirement visa is approved. This means that I will not comply with the requirement to keep 800k in the account for three months after the visa is issued. How will this affect me? Will it be checked (Bank statements) when I report after 90 days? How will thus requirement be enforced? Yes, I believe it is checked at the 90-day stage. Avoid dipping in if possible. One option is to have two accounts. Leave the one with 800K baht alone and use the other for year day to day expenses. Then when the waiting period is elapsed you can pull out what you need. If you need to physically present your bankbook every 90 days or get a bank letter, Immigration will be faced with a 900 pound gorilla.. Personally I expect the system will collapse on itself. Expect changes. An updated bank book is pretty easy for most to manage, to I suspect they will go with that. But yes, I expect changes soon enough because addressing the fraud by making the system more bulletproof stops the flow of black-market money, which means less tea money for everyone. Not only that but it will be the demise of the 90 day online and mail reporting. The whole system is archaic. Repriprocity is the only way to go. If a Thai citizen gets a US visa it can be good for 10 years and allow multiple entries and it only costs a couple of hundred dollars. Thailand needs something like that.. The difference is that it is very hard to get a visa for the US, whereas a Thai visa is easy to come by for most. So once you have that visa they need a system that ensures everyone is properly tracked - because the reality is that many undesirable, ill-intentioned people end up with visas. One alternative would be to make the requirements for a long-stay visa much stricter, and the initial checks much more thorough - like the US. This could be a 5 or 10 year visa, like you suggest. But then we have to be careful what we wish for, as we've seen with the most recent changes. Sure, it's annoying to have to report every 90 days and it could be made easier by simply checking in at a local police station instead, or having online reporting that actually works, but up until now, in general, it has kind of worked. FYI: Here's an update I received by email from an expat doing a retirement extension renewal in Chiang Mai:The way you lay it out may be the letter of the law but it is not how it is being enforced in Chiang Mai.They accepted twelve US bank statements confirming my income. For this year they just need to see a few International money transfers into a Thai bank that would either add up to 800,000/b yearly or be augmented with a bank account all totaling the called for amount.They seem to understand that we did not have time to prepare this year but expect to see all the transfers next year.My situation happens to be monthly but I don't think that really matters. International documented transfers to a Thai bank and/or money in the bank totaling 800,000/b is all that they are after.My impression was that as Consulate letters are nonexistent they are accepting that and just moving on. All of my transfers have been made via Transferwise. The amount that you transfer is aggregated along with other transfers to get the best exchange rate. Once the money is in Thailand it shows up as a deposit in my Bangkok Bank account. Immigration has never questioned the deposits as they appear in the Bangkok Bank passbook which I present along with the bank statement. Note, that as a US Citizen I also have to abide by US banking laws, so I make my transfers in 3 payments to avoid problems. How to get Non o in Thailand instead of returning to home country? Immigration will accept a fixed term account as long as the funds can be withdrawn without delay or penalty other than loss of interest. But as James said, interest rates are really low here.